How fat would we have to get to balance carbon emissions? Let’s consider a ridiculous solution to a real problem. We’re unearthing tons of carbon, burning it, and releasing it into the atmosphere. 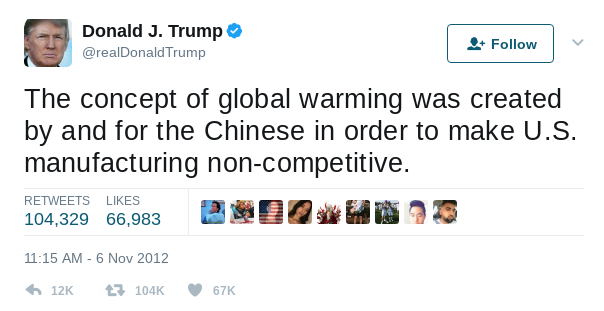 Disclaimer: There are several greenhouse gasses, and lots of other things that we’re throwing wantonly into the environment. Considering them makes things incredibly complicated incredibly quickly, so I blithely ignore them in this note. You know what else is a problem? Obesity! How are we to solve all of these problems? Looking at this (very unscientific) graph,4 we see that the red isn’t keeping up! Maybe we aren’t using the valuable resource of our own bodies enough! 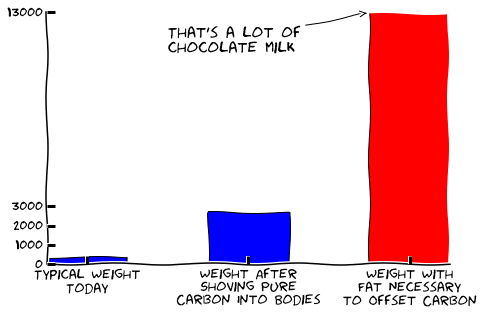 Fat has carbon in it — often over 20% by weight. What if we took advantage of our propensity to become propense? How fat would we need to get to balance last year’s carbon emissions? That’s what we investigate here. We need some data. It turns out that, despite knowing that we put a lot of carbon into the atmosphere, I don’t have any idea how much a lot actually is. Usually it’s given in nice, relatable terms that we’re supposed to be able to make sense of — like estimates on the number of degrees of warming to expect given a certain amount of emissions. So question number one: how much carbon do we put into the atmosphere? 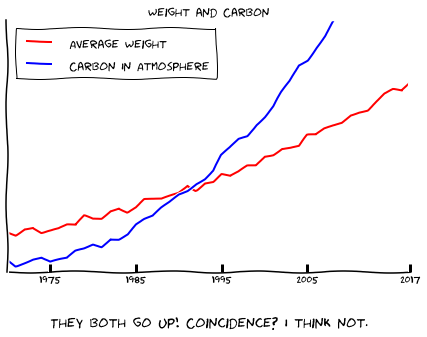 So how fat would we need to get to balance one year of carbon emissions? If every man, woman, child, and elder gained a mere 2700 pounds (1226 kilograms!) of pure carbon, we would successfully sequester one year’s worth of carbon. Unfortunately, that means about 13000 pounds (6000 kilograms) of fat, which is a bit much. So the chart really looks like this. Wow. So this isn’t a reasonable carbon sequestration plan.8 We toss an unbelievable amount of carbon into the atmosphere. According to LiveScience, a fully grown T-Rex could weight as much as 18000 pounds (8160 kilograms). If we assume that the overall body composition of a dinosaur is about the same as a human,9 so that roughly 20% of a T-Rex’s weight is carbon, then a fully grown T-Rex might have 3590 pounds of carbon within his or her body. This is approximately the same amount of carbon that corresponds to each man, woman, child, and elder’s carbon use in 2014. That’s a weird thought. How much carbon did we pull out of the ground and burn in 2014? About the same as if every human dug up a fully grown T-Rex, burned it, and then resumed their normal lives. A fully grown male African elephant can weigh as much as 6000 kilograms. So we might grasp the magnitude of this as thinking of every person unearthing a fully grown male African elephant each year. Alternately, although we can’t gain enough weight to sequester enough carbon, elephants can. We could initiate a policy where every human adopts and raises a new African elephant each year. I think I’m starting to get a bigger idea of just how daunting a task of large scale carbon sequestration will actually be. 2700 pounds per person per year. Whoa. Let’s move away from fat, towards better ideas. Following guidelines set by the US Forestry Service for computing tree weight, a fully grown oak tree can weight as much as 14 metric tons, with as much as 4 metric tons (8800 pounds) being carbon. Thus one fully grown oak tree can hold three people’s average yearly carbon emissions. Instead of an elephant a year, every person could plant an oak tree every year. (Actually, it just takes one in every three people). If these trees never died and were able to grow to complete size, then this would also offset carbon emissions. Conversely, when we cut and burn down trees, these release lots and lots and lots of carbon. Of course, oak trees are probably not the best choice for a carbon sequestration tree, and there are probably plants that, in optimal growth conditions, hold a much higher carbon per square mile concentration.11 Perhaps some trees are three times as effective (a Maryland per year), or maybe even ten times as effective (a Delaware per year). But that is the magnitude of the effort. Now if you’ll excuse me, I’m going to go hug a tree. Including the US and China (the two largest contributors), as well as the EU. Scientist and energy companies urge Trump to stay in the agreement, but Trump has already begun to undo efforts on managing climate change. You can even check the most up-to-date readings. No really, the data is made up. But the trends are more or less true — I bet you believed it, didn’t you? It tells us that the USA uses a lot of fossil fuels. And also that India doesn’t use nearly as much per capita as many other countries, among other things. China released 9376 MMTons CO2. The US released 5507 MMTons CO2. Apparently, there are 7.5 billion people alive today. That’s the number I’m going with. On the other hand, it compares favorably to some of the suggestions out there today. Alternately, this is about 1% of the area of Brazil. Given the rate of deforestation of Brazil, these estimates make some sense. I wonder: has this been studied? I would be curious to know the answer. 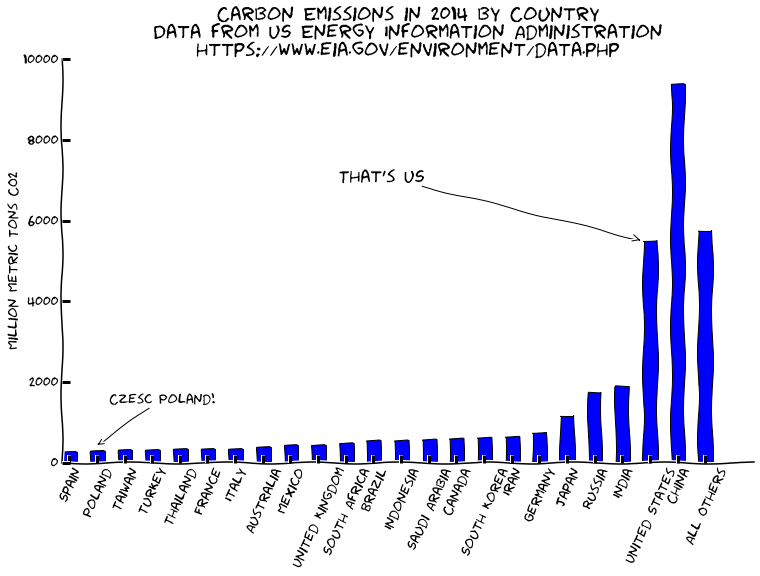 This entry was posted in Data, Mathematics, Story and tagged carbon sequestration, data visualization, global warming, xkcd style graphics. Bookmark the permalink. 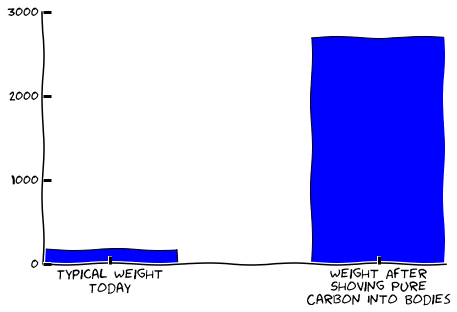 One Response to How fat would we have to get to balance carbon emissions? wait… 3000 pounds per year? We’re all going to die.